Hey guys! 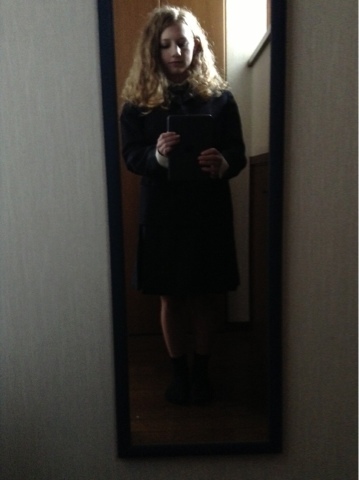 So, first of all, I'm officially a prep school student! At a knee-length-skirt, shirt-tucked-in, all-buttons-done-up, blazer-and-tie, the-uniform-actually-looks-good kind of school. Feeling a little spooked. Despite all that though, we're allowed to have our hair down! Stoked! Thanks for linking me that app, dad! Second of all, oh man, I have so much to say. I've been getting stared at a lot recently, which is understandable. I've never been so conscious of my hair! I expected it. But what's odd is the way they stare. It's not like how people stare in New Zealand. In NZ you can usually read why they're staring on their face; "I think I've seen her somewhere before." "What the hell is she wearing?" "I like those earrings." But when Japanese people stare, they have zero expression on their faces. It's the strangest thing! And usually, in New Zealand, if you want them to stop staring you just have to stare back and they get embarrassed and look away. But the Japanese are completely undeterred. I usually end up having a really weird moment of eye contact before they pass by. I don't usually get the feeling that they're judging me, so I don't really mind. Some Things I Forgot to Mention etc. My grandfather and grandmother live next door. They're interesting people and very nice. Grandma'salways bringing over food. Grandpa's adorable, always trying to improve his English. He showed me a track about 2 minutes away from the house which I've now been running. Packing for warm weather was a huge mistake. I thought since the cherry blossoms were blooming it would be spring. Nope. It's the warmer end of winter, which means the whole house is freezing except for the living room, which is heated and is still slightly chilly most of the time anyway. I'm no longer laughing at heated toilet seats. The Japanese seem to eat a strange mixture of extremely healthy food and sweet stuff. At the end of the day though, despite all the cakes and cookies grandma keeps bringing over, my diet still appears to be healthier than in New Zealand. The vending machines sell hot drinks like coffee, and I saw one that only sold ice cream! Will have to try that sometime, though I doubt It's very good. Everything is super super cute, especially the clothes! I want everything!! Manga is soooo cheap. The not particularly popular ones are about ¥350 ($4.50), the midway ones are about ¥400-¥480 ($5-$6), and the Kuroshitsuji I bought, being a big name, was ¥571 ($7.20). Which is apparently expensive in Japan. I just about died from happiness. 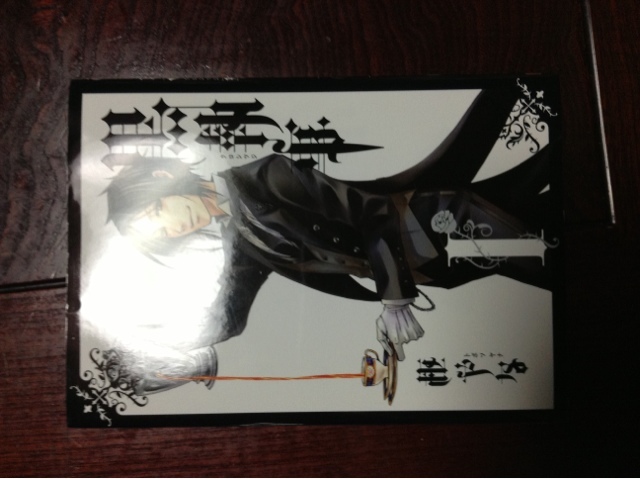 I will buy soooo much manga! I thought I'd watch a ton of anime here, but I haven't watched a single one yet! A little sad about that. I have so much more I could say but this post is getting a little too long, so maybe another time! See you all later! You guys have no idea how hard it was to get access to wifi at my new home. Be grateful! Man, I can't believe it's finally happening. Everything is so massively different, it's just incredible. I've been here five days and there's already so much to share! The next day we got a bus to Oosaka, which took about nine hours. You know how you hear that Japanese food is really healthy? Well, most of it is, but their sweet things are super super sweet! Our entire lunch was bread filled with sugary creams, it was crazy. On the toilet breaks I learned that Japanese toilet seats are heated! It felt so weird at first! For the next two days we stayed at a more Japanese-y hotel, which had a public bath, which really wasn't as embarrassing as I'd thought it would be and was actually really relaxing. The food was really filling and healthy and I thought hey, maybe I'll lose weight after all! But then on the bus ride to the train station yesterday they fed us that sugary bread again, yick. I rode a Shinkansen to Hiroshima!! It was incredible! Pictures on facebook! So now I'm at my host family's house. They're really nice, and my mother cooks really well. They do laundry every day and let me wash my hair in the morning. I was really tired that first night when my parents and I had a really long talk, laying down the ground rules. My head was buzzing afterwards from trying to understand that much Japanese! Today we went shopping for school stuff. Man, absolutely everything in Japan is cute. 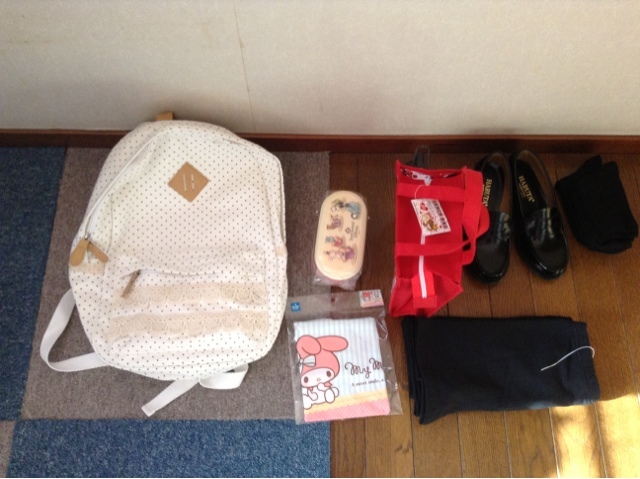 I'll upload a picture of the school bag, Bento box and bags that I bought. They're totally girly. I'm having problems with my card for some reason so I haven't got any cash yet, so my host parents had to pay for my stuff, but as soon as I have money I'm gonna try and pay them back. Tonight, I'm trying natto for the first time! Can't wait! Hope I like it!